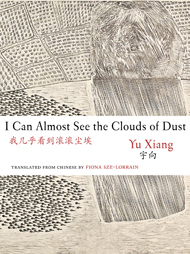 So if you’re looking for a well-informed analysis of how Yu Xiang’s first full-length work translated into English fits into the body of post-war Chinese poetry, or the unique position she occupies in Chinese society as a young female artist from the dialectically distinct city of Jinan, well, I’m sorry. I’m just here to recommend a book I liked. I Can Almost See the Clouds of Dust is a low-key, undemanding, open-ended sequence of delights. Many of the poems are just tiny snippets of experience, so with a few exceptions (the series “The Painting Life,” the long poem “To the One Who Writes Poetry Tonight”), I tended to absorb the book more as a single entity than as a series of separate poems. That’s not to say the poems aren’t fully realized as independent pieces, or can’t be very different from each other in tone and approach. There’s just something about Yu’s ego-free observational style, and her tendency to pull a single kernel of knowledge from each experience, that makes it very easy to glide from one page to the next uninterrupted. I’ll quote one poem in full to give you a taste. It’s a little like some of Frank O’Hara’s poetry (I’m thinking of “Les Étiquettes Jaunes,” which sadly I can’t find a good link for – “Leaf! You are so big!”). The style is so sweet and unassuming that it almost obscures the poem’s thoughtfulness. The inward turn at the end isn’t profound, exactly, but it does feel genuine in a way that more elaborate moments of epiphany rarely do. I’m happy to bask in the strangely beautiful layering of imagery, the “square of abundant sunlight” set against the twitching flies, and don’t get too wrapped up in the idea that this scene is representative of greater things. That offhand little phrase “I guess” is a nice moderation of the more perplexing power of “holy front,” a way to lighten the mood and lower the stakes even as the poem plunges deeper. Which is, I think, a good description of her style – her vision may be strange, but it isn’t so tortured with meaning as to be quite surrealist or symbolist. It’s indeed authentic. Even when she’s shaving mice, Yu isn’t trying to conjure up more than the world as it is. I love the way “it has to do with nonbelief” is quickly slid in there and then passed blithely over. We’re not pressured to think too hard about how nonbelief governs this image, but its influence is now there. And she’s a little mischievous, too; her poems don’t sit still and do what they’re told. Her old man isn’t quite a font of wisdom. He’s a little confused, a little out of his depth. Finally, a whiskey book! Down to earth, straight to the point, utterly authentic – Yu makes it easy to pull out one of my favorite recipes. My first instinct was a Manhattan, but there’s something too serious and brooding about a Manhattan for this book. So I’m going with a somewhat sweeter variation, using Benedictine, which is just faintly herbal; the spice of a rye whiskey sets it off wonderfully.